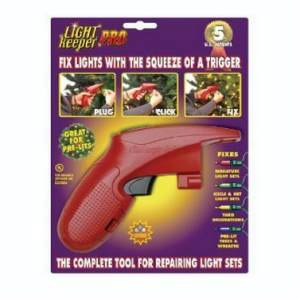 Latest technology for repairing non-working mini lites in a hand-held trigger-action device. Ideal for mobile use by commercial lighting crews. Simply plug in the defective set and pump the trigger to fix most sets. Continuity detector allows analysis of the light strand itself. Three-way bulb puller makes stubborn bulb removal easy. Spare bulbs, fuses and battery included. Q: I have several sets of led lights. One defect I've come across several times is half a string works, the rest is dead. how come? and how to fix? A: Are your LED bulbs replaceable? If so, replacing a bulb may fix your issue. Most of the time a 1/2 string out indicates there is an issue with the wiring harness. You may need to restart your Christmas lights with a few new strings next season. Q: Will this tool work on led icicle lights? This tester is designed to work with incandescent mini lights - sorry, it won't work on your LED icicle lights. For future consideration, consider plugging all of your LED sets into a surge protector. If your installation is out of doors, you can find outdoor rated surge protectors - some even have built in timers. Other than degradation in the wiring due to UV and environmental exposure, surges on the lines will have the most negative impact on your LED lighting. Was this answer helpful? 3 of 7 Customer(s) found this Answer helpful.